Penrhos Park Hotel01974 202999work HotelWithin 150 acres of lush green countryside in the Wyre Valley, West Wales, rests this unique country club and golf complex complete with its own luxury hotel. Designed with the golfer in mind, this holiday destination offers attractions for all the family, however, with extensive sport and leisure facilities and picturesque grounds to explore. Here, you will find comfortable en suite rooms, an indoor heated swimming pool, 27 holes of golf and a new flood lit driving range. Within 150 acres of lush green countryside in the Wyre Valley, West Wales, rests this unique country club and golf complex complete with its own luxury hotel. 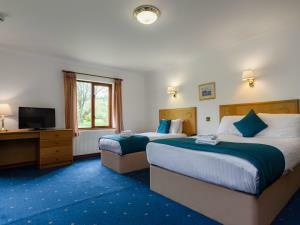 The accommodation at Penrhos Golf and Country Club consists of 15 Junior Suites. Each room has twin beds, a double sofa bed (metal action pull-out) and has en-suite shower, bath and toilet. There is also a mini kitchen with a microwave, kettle and fridge. No smoking in bedrooms. Children welcome from any age. Turn off main A487 in Llanrhystud onto B4337 - 1/2 mile on left. DISABILITY ACCESS STATEMENT Penrhos Golf and Country Club offers the ideal place to relax and explore the beauty of Mid Wales. Whilst Penrhos is predominantly a golf club there are a wide variety of facilities for both golfers and non-golfers, both able bodied and disabled alike. On offer are a leisure complex, restaurants, conference facilities, two golf courses, a driving range, hotel and holiday park. The Clubhouse. The car parking area for the Clubhouse is level with a disabled parking bay immediately in front of the main entrance. The main access to the Clubhouse has a ramp with a gradient of 1:10 (approx). There are no steps into the Clubhouse; however, there is a small threshold (6 cm). There are a further three access points to the Clubhouse. The access at the rear of the building is level with a small threshold. This is the main access from the hotel to the Clubhouse. Within the Clubhouse there is a reception area 2 restaurants 2 bars toilet facilities a club shop the swimming pool and conference facilities. One of the restaurants and the conference facilities are on the upper floor of the Clubhouse and so are not accessible for wheelchairs. However, conferences can be accommodated on the ground floor if requested. There is a unisex toilet in the reception area, which is adapted for wheelchair users. The club shop is accessed by four steps. The swimming pool is accessed via the changing rooms, which have four steps from the reception area. Entry into the pool is via steps with a handrail. Reception Reception is open daily from 8.00am and shuts when the clubhouse shuts in the evening, normally, at 11.00pm during the summer months. This can be earlier during the winter months. In the unlikely event that a guest requires assistance when the reception is not open they may telephone the proprietors (Out of Hours contact details will be provided on your arrival). Hotel The hotel is situated 30meters from the Clubhouse and has its own dedicated car parking facility with one space provi ded for disabled drivers. The hotel consists solely of 3 blocks of five rooms and all are on ground floor level. Each of the blocks has one step. The first block has ramped access. One room within the first block has facilities for disabled guests (Room 1). All other facilities are situated in the clubhouse. Room 1 Room 1 is a twin bedded en suite bedroom with a kitchenette area. The bathroom in Room 1 has a toilet with grab rails and a padded backrest. The sink is within reach of the toilet. The shower has no lip and is therefore accessible in a wheelchair although no shower wheelchair is retained on site. The 2 single beds (height 64 cm) can be moved, if required, for easy access. The kitchenette area has a kettle, sink, a microwave oven, crockery and cutlery. The microwave oven is on a higher shelf (height 1.45m). In the room there is no means of contacting the reception. It is advisable, therefore to come equipped with a mobile phone (see below). We are unable to provide a 24-hour service. It must, therefore, be left to the discretion of wheelchair users as to whether the facilities provided are sufficient to stay without being accompanied. Holiday Park All of the rental caravans have, usually, 3 or 4 steps. The hallways are quite narrow and bathrooms small. We take the safety of our customers very seriously and have, therefore, introduced a 5 mph speed limit in all areas. To facilitate this speed limit speed ramps have also been introduced. Assistance Dogs Assistance dogs are very welcome on the holiday park, in the hotel and in the clubhouse. We have areas around the complex where dogs may be exercised. However, we would be grateful if you would check with the staff prior to walking your dog. Transport The complex is set in a beautiful scenic valley and the bus service can be found half a mile away in the village of Llanrhystud. Buses run regularly throughout the day both north to Aberystwyth (9 miles) and south towards Aberaeron (7 miles) and beyond. There is usually a full bus timetable available in the clubhouse reception. There is also a local taxi firm – Lloyds 01974 272000 – which has a people carrier with wheelchair access. Early booking is to be advised. Mobile Phones & Communications At present Orange is the only mobile phone network with coverage at the complex. However, other networks have coverage in the village. We have a wi-fi hotspot in the clubhouse and it is intended that this will be extended to the whole complex in the near future. Shopping Llanrhystud has a Post Office, a small supermarket a florist and gift shop and garage. Aberystwyth and Aberaeron have a larger variety of more interesting shops. Aberystwyth has a shopmobility scheme. Equipment for disabled guests We do not have specific equipment on site. However, equipment can be organised in advance locally from Cantre Mobility on 0808 1001133, (wheelchairs, scooters and hoists etc). If you book equipment prior to your arrival, once delivered, we will be happy to retain the equipment in reception ready for collection on your arrival. Staff Our staff are not formally trained in the care of guests with disabilities, however, we are here to make your stay as enjoyable as possible. If you feel you need help at anytime during your visit, please mention this to any member of our staff and they will be delighted to be of assistance. Our commitment to accessibility We constantly endeavour to improve accessibility to all our guests and any comments you have would be most welcome. Please pass on your comments to any of our staff or contact the proprietors directly. If you require any further information relating to the accessibility of the complex please do not hesitate to contact us on 01974 202999, e-mail info@penrhosgolf.co.uk or in person and we will do our best to answer your queries.